The first had better story, but this sequel have better action. So they actually have to tell people to leave the Bronx? Silva gives a weirdly disembodied performance, despite the occasional outburst (was he on Valium?). That Eddie Van Halen dude and his cohorts killed more guys in uniform than Clint Eastwood did in Where Eagles Dare; damn, that was a lotta dead astronauts! And what actually was the point of all of this?--oh yeah, to usher in Bronx Warriors 3. I did sorta like the kid though--he proved resilient. Great MST btw. Marginally better than the original, probably because the plot was less incoherent. The most notable thing about this movie is not the spacesuit-wearing cops who march through the Bronx incinerating hobos alive, but the last half hour of the film, which is literally nothing but one death after another. I like to think my friends and I are pretty seasoned viewers of action and B-movies, and at one point someone exclaimed "is anyone even left?!?" 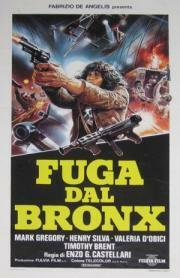 Insanely violent Italian action trash. The last 40 minutes is one long running gun battle, and an absurd number of people are shot or blown up. Enzo loves the slow mo. LEAVE THE BRONX Warriors 2 on the shelf.